When it comes to breeding fish, paying attention to detail will greatly improve your chances of success. Bear in mind that relatively few fish display any signs of parental care, so it is up to you to protect the eggs or fry from being eaten by the adults. It is worth setting up a separate spawning tank so you can create the ideal conditions to suit a particular species. Spawning is a stressful activity, especially for the female, so provide the pair with a nutritious diet to restore their condition. This will also improve the chances of their spawning successfully in future. Take care not to overfeed the female while she is confined, because any uneaten food will pollute the tank, endangering the health of the fry in due course. 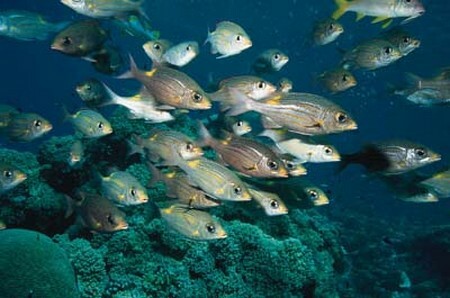 Young fish tend to be more vulnerable to ammonia and other nitrogenous products in the water than adults. Filtration within breeding tanks is therefore of particular importance. A foam filter is usually the best choice; unlike a power filter, its gentle movements are unlikely to pose any hazard to the young fish. Undergravel filters – This type of filter is not feasible in the short term, because of the length of time that it takes for the filter bed to mature. l Improving filtration – If desired, use a special bacterial culture to help to speed up the biological activity of a foam filter. Tank decor – On grounds of hygiene, keep decor in the breeding tank to a minimum, otherwise there is an increased risk of outbreaks of fungus, for example, which are especially likely to be harmful in the period that any eggs are developing in the tank. Lighting – This is not needed over the spawning tank, especially in the case of tetras – their eggs are adversely affected by exposure to bright light. In the case of livebearers, such as guppies, a number of the fry will be eaten by the other fish, including their own mother, although some offspring may survive in a densely planted tank. A simple way of avoiding this problem is to transfer the female to a breeding trap in a separate tank. This allows the fry to escape through the trap, while the mother is too large to follow. The breeding tank may be relatively small, with a gravel base and plants incorporated into one half. Aim to move the female into a separate tank before she shows signs of giving birth, otherwise there is a real risk that she will abort her brood prematurely. As the time for producing her brood approaches, she will start to swell in size, with a definite black spot appearing on her flanks. 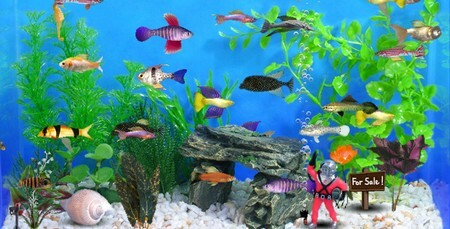 The tank set-up should be influenced by the breeding behaviour of the particular type of fish. Tank dividers can be useful with egg-layers, especially for species where the male tends to harass the female. This helps you ensure that both fish are equally ready to breed before you put them together. Some species lay their eggs on rockwork, so provide this where necessary. Fish that are likely to consume their eggs should be housed in such a way that the eggs are placed out of their reach as soon as possible after laying. Plastic mesh – One way to achieve this aim is with a guard of thin plastic mesh, sunk in a U-shape into the tank. The eggs will fall through the mesh, out of reach. When putting this mesh in place, allow enough space for the fish to swim and spawn easily. Check that it fits snugly at each end, so none of the adults can slip through. After egg-laying, transfer the adults back to the main aquarium, and remove the mesh. Marbles – With larger egg-layers, it is better to line the floor of the tank with marbles – the tiny gaps allow the eggs to slip down to relative safety. Only half-fill the tank, setting the heaterstat accordingly, before placing the fish in their spawning quarters. Certain egg-layers, such as tetras, actively seek to spawn in plants, rather than scattering their eggs at random around their quarters. In the spawning tank, you should include either artificial spawning mops, or plants with feathery leaves, like fanworts (Cabomba species). Mops have the advantage of being more sterile than plants. Arrange the spawning mops or plants to provide fairly dense cover, since the fish will swim in and spawn among the strands or foliage, leaving their adhesive eggs sticking to them. If setting up a breeding tank for gouramis and related species, you should cover it to prevent the newly-hatched fry from becoming chilled. Include floating plants, as an anchorage point for the bubble-nest which will be constructed by the male. Once this stage is reached, you can introduce the female, and spawning should take place shortly afterwards. Once the female has laid the eggs, she should be removed, leaving the male to guard the eggs. At first, you should not use any filtration in the tank, because it can easily destroy the delicate bubble-nest, but you will need to introduce it at a later stage.